Committee meetings on redistricting are open, as with meetings on any other bill, and citizens can also submit their own plans for consideration . Both the Senate and House have redistricting pages with information, schedules, and maps. The legislature. The governor has veto power over congressional and state The Judiciary Committee in both houses have jurisdiction. legislative district plans. South Carolina's 6th congressional district was challenged as a "racial gerrymander" twice. In 1993, a district court ruled it unconstitutional; the legislature made adjustments for the 1994 elections, but another suit was filed. In 1997, the case was settled before trial. The settlement agreement delayed the plaintiffs’ suit until after the General Assembly's 2000 session. 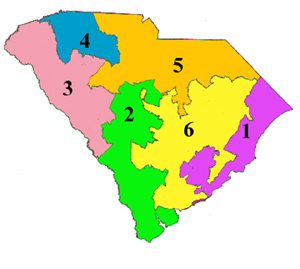 In 1996, several house and senate districts in the South Carolina General Assembly's legislative district plan were challenged as unconstitutional racial gerrymander. The trial court declared six house and three senate districts unconstitutional. The General Assembly passed a modified house plan, but the court ended up drawing a senate plan. Two black incumbent legislators were defeated in special elections in 1997, despite black adult populations of more than 40% in their new districts. South Carolina has divided partisan control over redistricting in 2001. A likely result is preservation of the current 4-2 Republican advantage in U.S. House districts, with Democrats seeking to shore up John Spratt’s 5th congressional district.